Malawi vice President Dr Saulos Chilima who is also the leader of the newly formed political group, United Transformation Movement (UTM) on Saturday endorsed the anti-government demonstration organized by the Human Rights Defenders on 21st September, 2018. Chilima made the endorsement at Gymkhana Club Ground in Zomba where he was launching his political group. He also attacked the ruling Democratic Progressive Party (DPP) for blocking the organized demos saying such acts are barbaric. “First let me urge you stop fearing a person because of his or her political position. I also want to warn those blocking Malawians to go on street to immediately stop that as it is undemocratic. Allow Malawians to demonstrate against anything affect them as it is their right,” said Chilima. 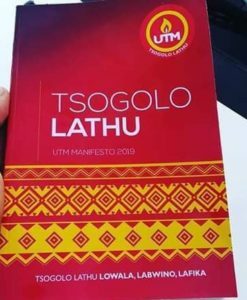 On other issues, the UTM leader attacked the DPP regional governor for the south Charles Mchacha for uttering bad words against women as well as his political group. Mchacha described women joining UTM as prostitutes while calling the whole movement as satanic. “Kunali anzanu oziwa kuyankhula koma lero alikuti? Learn to speak facts osati kunyozana. What are you trying to teach our children?,” he added. He then vowed to change the face of Malawi if voted into power.